With cold grey days and Christmas festivities everywhere, it would seem winter has arrived over the last week or so. We’ve even had some snow! On days like these, I can’t wait to retreat to my lovely cosy bed at the end of the day. Fortunately, it’s easy to add little touches to your bedroom to make it cosier on a budget. One such way is with the use of bedspreads! Fortunately, you don’t need to spend a fortune on making your bedroom cosier. I know that money is in short supply at this time of year, being funnelled into gift shopping rather than the home. It needn’t be time consuming easier. A lick of paint in a warming colour may not be expensive, but will take time you likely don’t have in these weeks leading up to Christmas. Instead, my suggestion is to scatter a few candles around the room (fake ones are a safer option if you have children and pets) and get a lovely cosy bedspread to keep you warm on chilly nights. A bedspread is a simple way to make the room look much cosier too! If you opt for warm colours with your bedspreads, such as reds and oranges, the room will automatically feel more cosy. 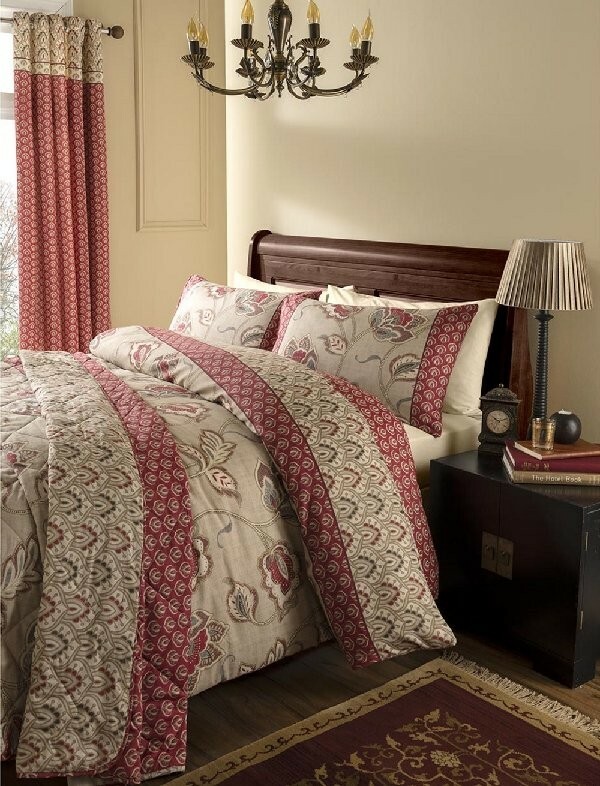 The colour and pattern of the Catherine Lansfield Kashmir Bedspread from Yorkshire Linen emanate cosiness. Its wintery floral pattern won’t look out of place as we emerge into spring, either. You can check the complete range of bedspreads from Yorkshire Linen here now for a cosy bedroom. If bold, statement coloured bedspreads are more your thing, they still look and feel cosy too. This Ingrid bedspread in teal from Terry’s Fabrics brings the warmth of the summer garden into your winter bedroom. Do you enjoy floral patterns, but prefer them to be a little more subdued? This gorgeous Catherine Lansfield Canterbury Heather bedspread from Yorkshire Linen is just the thing. In a dusky lilac, it looks very inviting! On the contrary, perhaps you enjoy sumptuous fabrics? A little luxury can make you feel very cosy indeed. Marshmallows and cream on top of a hot chocolate, for instance, always make it feel cosier than without! This Catherine Lansfield Crushed Velvet bedspread looks like just the place I’d like to snuggle down with a cocoa and a good book. Even keeping things very neutral can feel cosy. 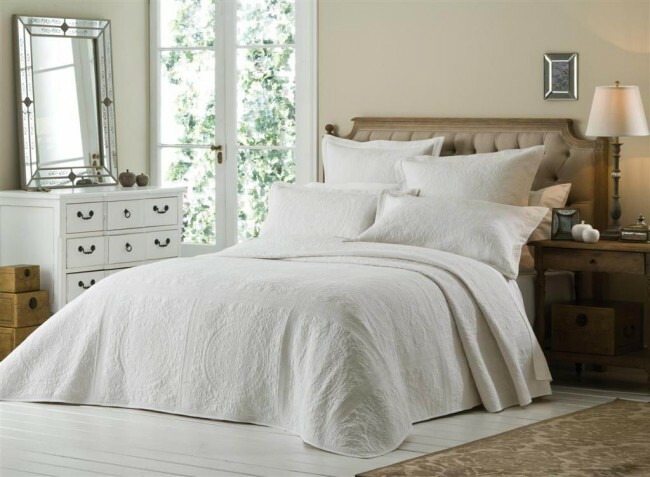 Although completely white, the beautiful fabric of this Versailles bedspread adds depth and makes it look cosy. So, will you be updating your bedroom with a bedspread to make it more cosy this winter? 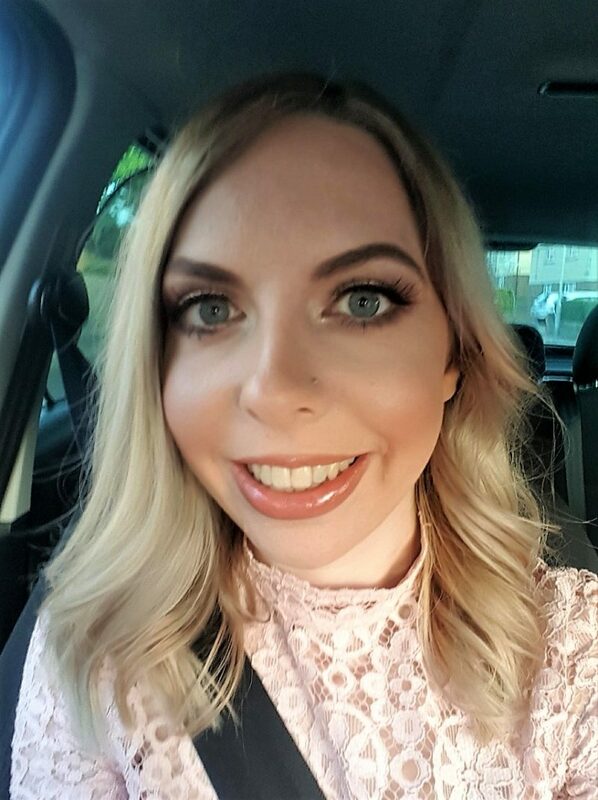 Disclosure: This is a sponsored post with Yorkshire Linen for which I have received compensation. As always, all views and opinions are honest and my own.